James Barrett, Brian Vinchesi, Robert Dobson, "Golf Course Irrigation: Environmental Design and Management Practices"
Golf Course Irrigation offers valuable insight on the design, installation, management, and maintenance of irrigation systems-the most important management tool used on today's golf courses. 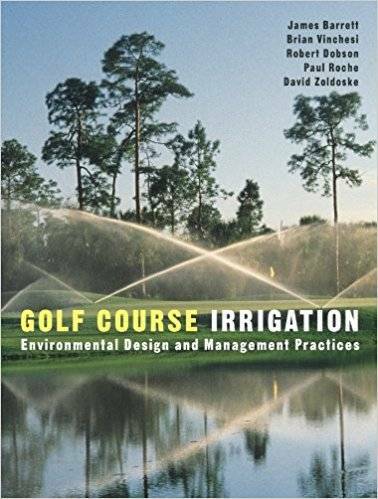 Without manufacturers' bias, this useful resource provides hands-on guidance to the highest quality irrigation systems, including specifications and applications of the best pump stations, controllers, sprinkler heads, nozzles, valves, sensors, and other components that make the difference in top-quality irrigation systems. Typically regarded as significant users of water, golf courses are under increasing scrutiny by governmental and environmental groups, making it essential that the up-to-date information found here-on such topics as water supply, plant irrigation requirements, application uniformity, and construction management-be at the fingertips of every golf course professional. While fostering the best playing conditions, these systems conserve water and energy with such technology as low-pressure heads and controls that use "if/then" logic to automatically adjust to changing conditions, which can improve playability while saving money. Golf Course Irrigation is a practical tool to help golf course architects, builders, superintendents, irrigation consultants, designers, and installers to improve aesthetics and playing conditions in the face of diminishing natural resources. It is also an informative reference for golf course owners, developers, local officials, students, and fans of the game.